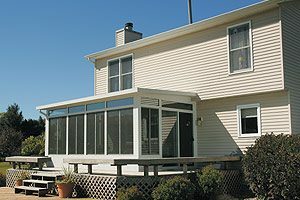 Screen enclosures installed by SRA Home Products are the ideal outdoor living product for homeowners in King of Prussia, Pennsylvania who would like to spend time outdoors without having to deal with bugs, windblown debris, and inclement weather. Screen enclosures make great places to host a party, install a hot tub, or enjoy a variety of other activities because, unlike with regular outdoor living spaces, you’ll never have to worry about a passing thunderstorm ruining the fun or pesky mosquitoes who view your guests as a tasty snack. Aside from these benefits, when you choose SRA Home Products to install your new screen enclosure, you’ll also have the pleasure of working with our factory-trained and -certified employees, rather than subcontractors. This allows us to guarantee that you will receive only the highest level of craftsmanship and professionalism during the installation process, resulting in a positive experience in every aspect. For more information regarding the benefits of the screen enclosures we install at homes around the King of Prussia, PA area, contact SRA Home Products today. Be sure to ask about available financing options for those who qualify.